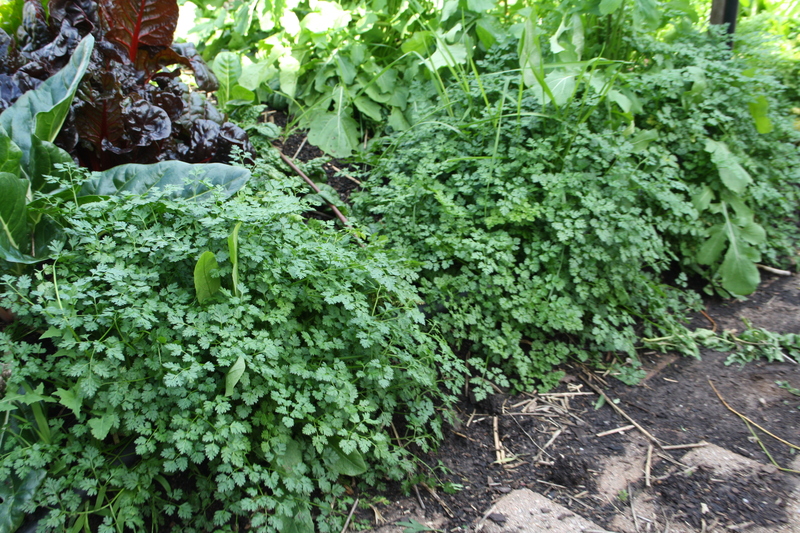 The chervil was really easy to grow. I chucked it in, without thinning out, at the start of winter… or was it autumn. Anyway, it’s grown steadily, in quite a shady spot too. I’ve never grown mustard before. I chucked this giant red mustard seed in, in autumn and never thinned it out. But it’s quite good picked young like this and added to salads. There’s also some kohlrabi struggling along. Did I mention rhubarb? I think I have a new obsession. 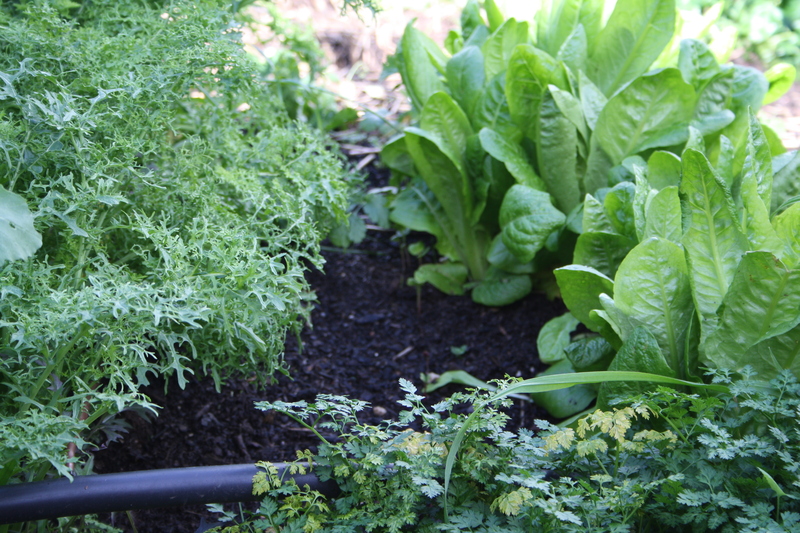 In my greens bed I have mizuna, rocket, and lettuce ready for picking, and chervil and parsley. All these things grow really well in winter here. Coming up are some new radishes (I’m such a failure at succession planting) and some spinach and silverbeet which I am hoping will take off in early spring. I should mention two other winter winners: sage and rosemary. The rosemary is flowering now providing for the bees over winter. 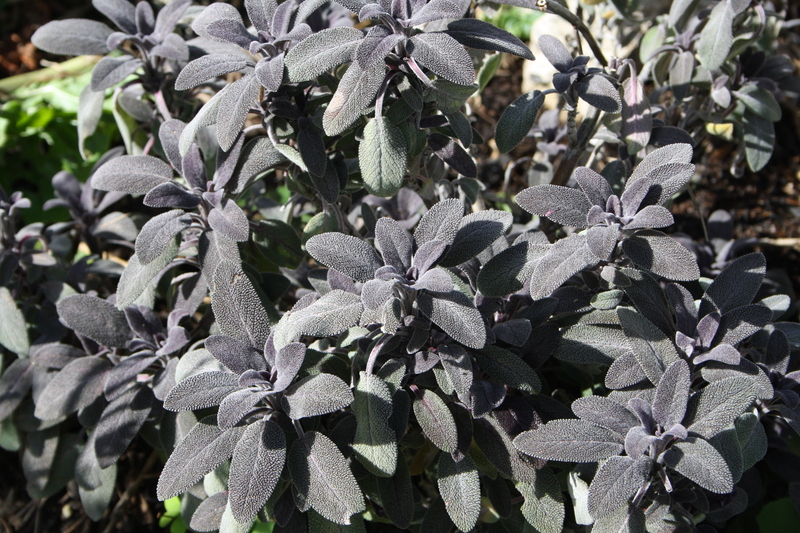 And I love this purple sage so much. It’s so tough and so beautiful. 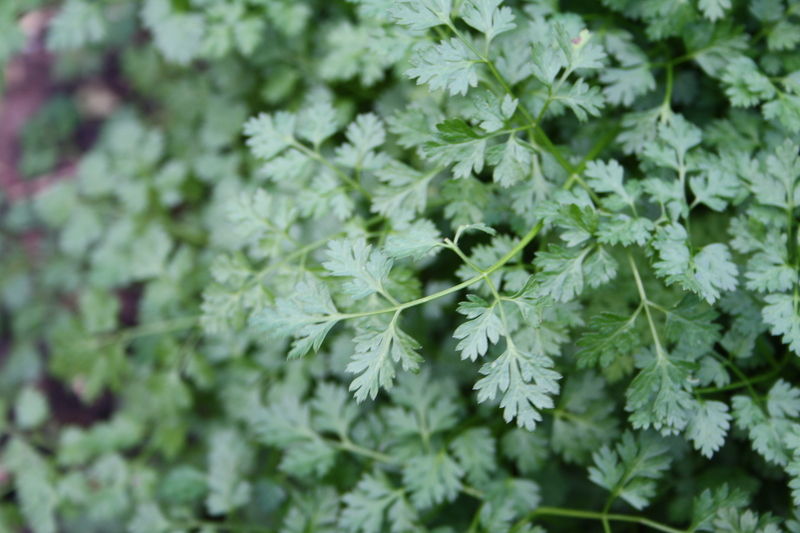 Such a great plant for the kitchen garden. The sage I grow in a pot dies back over winter but this looks just as beautiful and strong as it does in the warmer months. 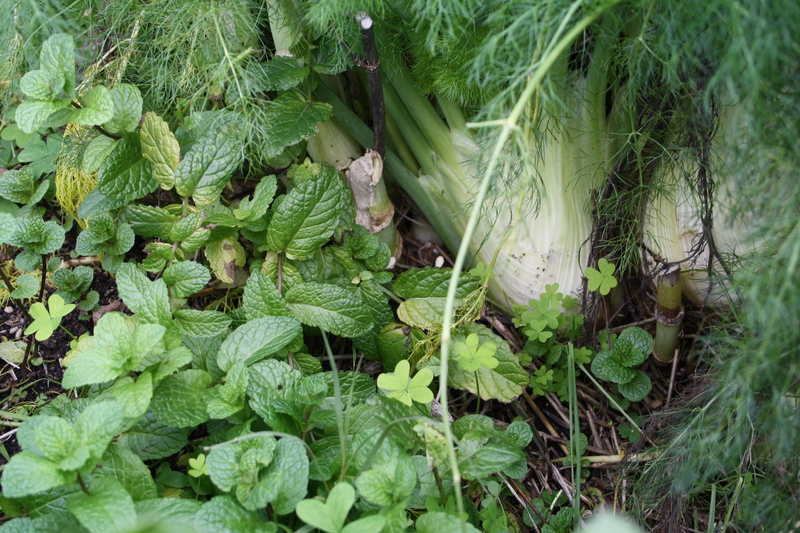 I also found some mint growing happily under the fennel bulbs from last summer that I never pulled out. The mint I have in pots dies down every winter, so interesting to see it so happy here. This is also right near a brick wall and on the edge of a high retaining wall, so maybe the frost doesn’t settle here. 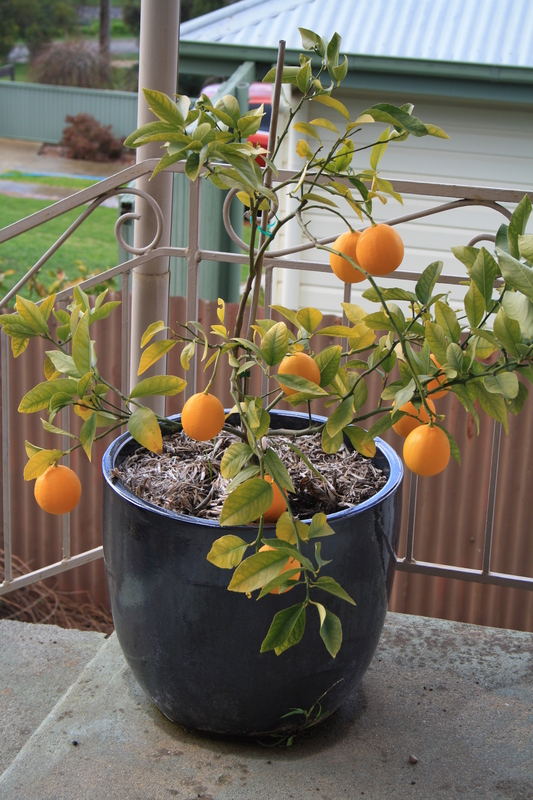 Winter fruit and a container growing victory. Sort of. My dwarf Meyer lemon. Look, er, it may have snapped in half from the weight of the lemons, and it is probably going to require some serious pruning and heaps of feeding. But I got my first ever crop of lemons. I’m deciding what to do with them. I saw a recipe in Stephanie Alexander’s Kitchen Garden Companion for lemon and date chutney which I think I will try. 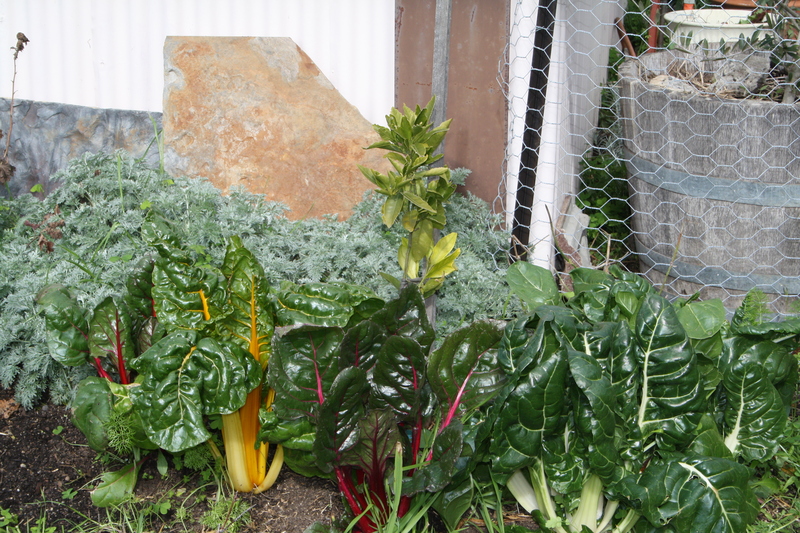 Rainbow silverbeet growing around my dwarf mandarin. 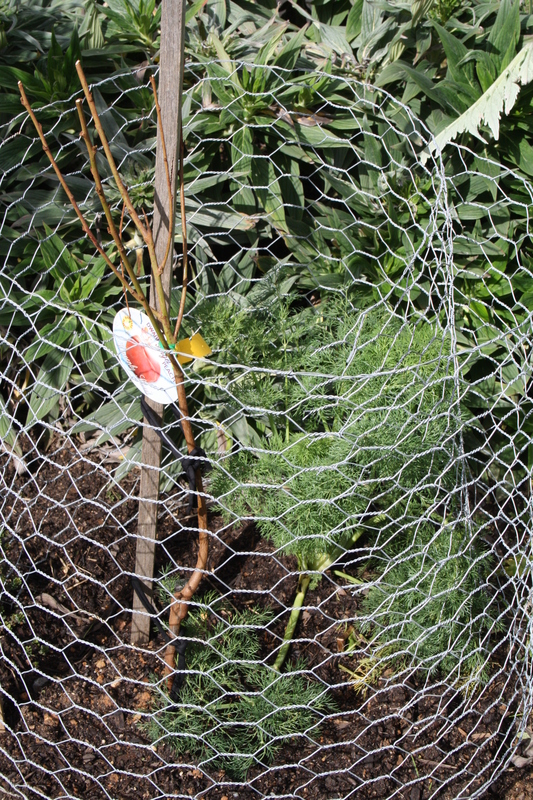 My theory was that it would help protect the mandarin from frost damage. The silverbeet is growing pretty slowly. I guess it will take off in spring. Sprouting broccoli which survived something largish flattening a lot of the stems right across the middle. A possum or a cat maybe? Anyway, I’m really, really hoping for a good harvest with this. Please don’t let it bolt before I get to harvest. Pretty please. 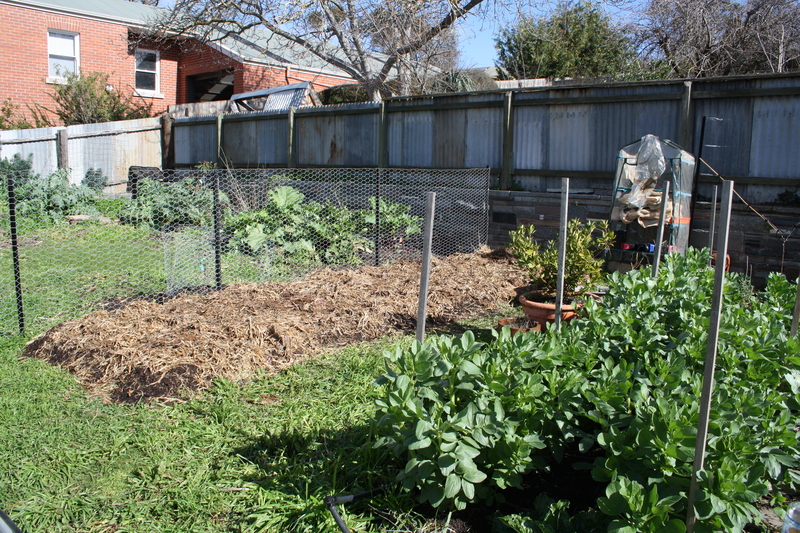 Broad beans, cabbage and Tuscan kale growing . 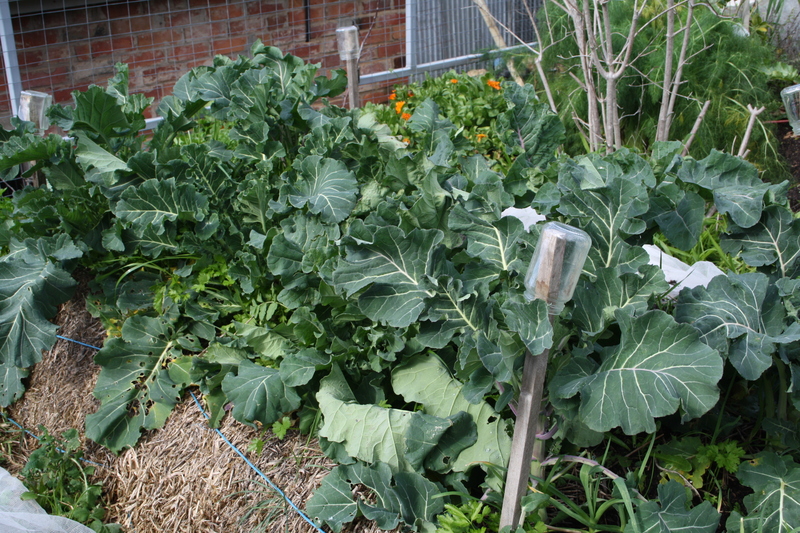 Despite netting, the kale and cabbages were infested with fat green caterpillars when they were young. I guess I put the nets on too late. Next year I’m netting them the day I plant them (I used seedlings form a nursery). Anyway, for a while there I had to go out every day and pick them off and feed them to the chooks. So I haven’t picked any of it yet as I wanted to give it a chance to grow some un-damaged leaves. I think I’ll be able to start picking soon. 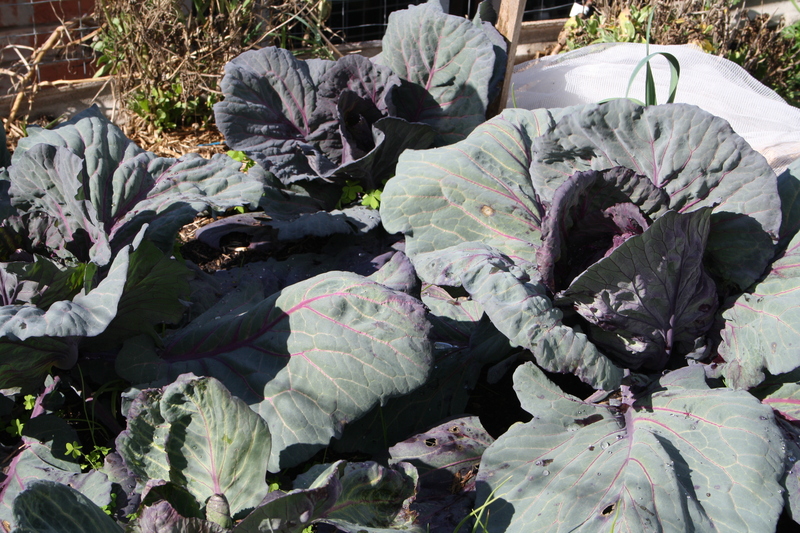 This cabbage is an heirloom variety called Red Drumhead which I grew mostly because I really love the colour. I’ve never had much luck with cabbages, cauliflower or broccoli. This year I added lots of manure and compost and a handful of dolomite lime to the soil. And as well as picking off the caterpillar we also had a plague of aphids on them. It wasn’t until we got some really frosty weather that they disappeared. Anyway, some of them have survived. I think one of these is balling up, fingers crossed! I had a nibble on one of the outer leaves and it tastes really sweet. 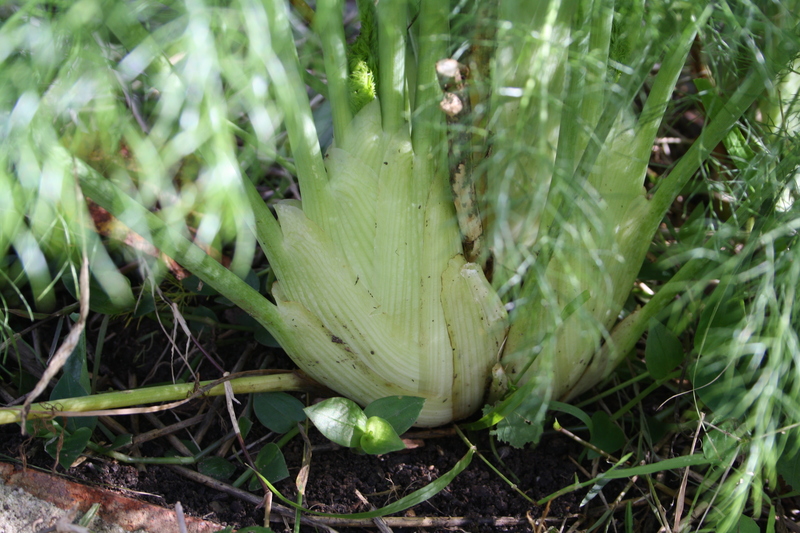 Fennel. 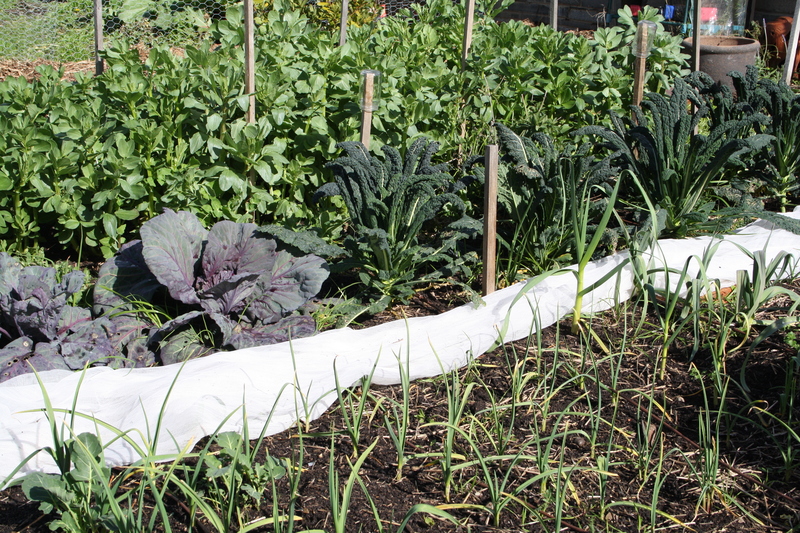 It also stays lovely and green all winter – I think its role in the garden beyond producing wonderful veg is under-rated. Should I pick these bulbs? I never thinned out the young plants so they’re all squashed together. 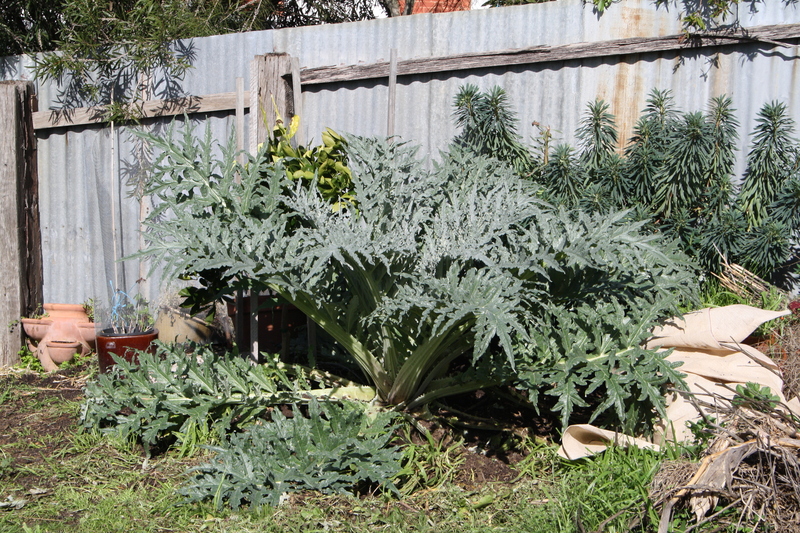 The artichokes have been growing steadily throughout autumn and winter. This one is smothering my washington navel but I think it’s actually providing protection from the frost, so live and let live in this instance I think. I know some advice suggests cutting them to the ground in autumn. I couldn’t bear to do it as I have so little greenery in the garden. I’ll see how they fruit and report back. Lots of fruiting buds on my dwarf apples. These are the stepovers, which can apparently fruit in their second year. Fingers crossed. 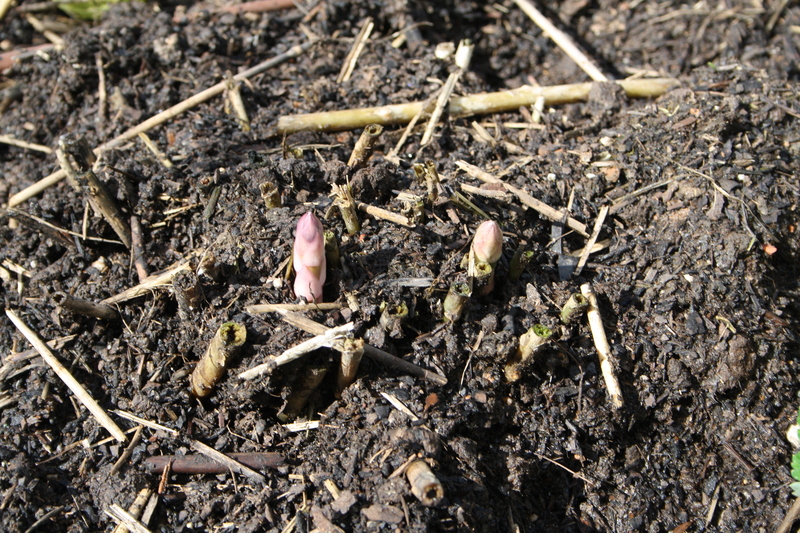 Purple asparagus poking up its head. I thought this would be a month away. I heard that frost can damage spears so I may cover with some straw to insulate it. 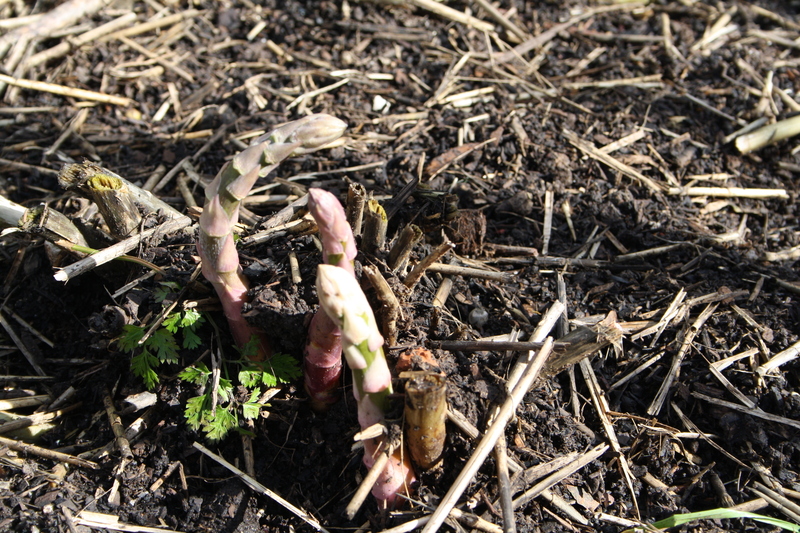 Here’s some Mary Washington asparagus. These were one or two year-old crowns when I planted them (amazingly they survived my neglect when I brought them home from the nursery) so I think I should be able to start picking a bit this spring. 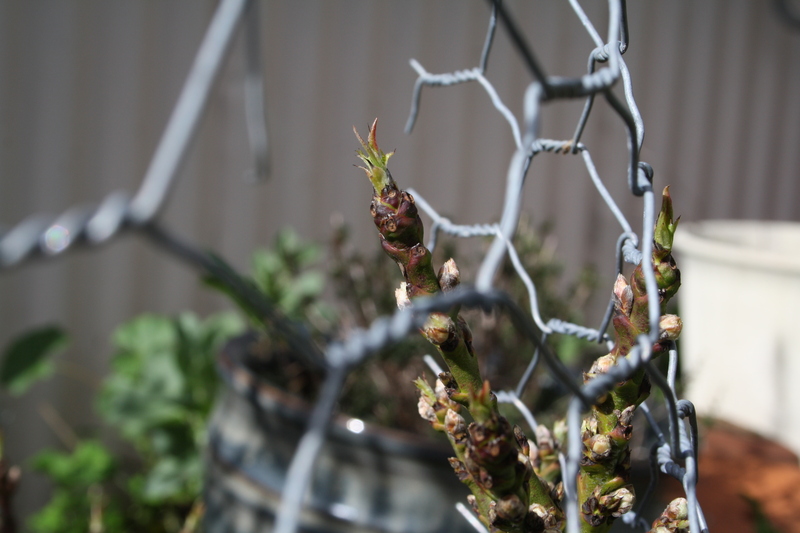 My dwarf nectarine showing bud burst. Goji berries is about to shoot also. I wonder how many years you have to wait for fruit? 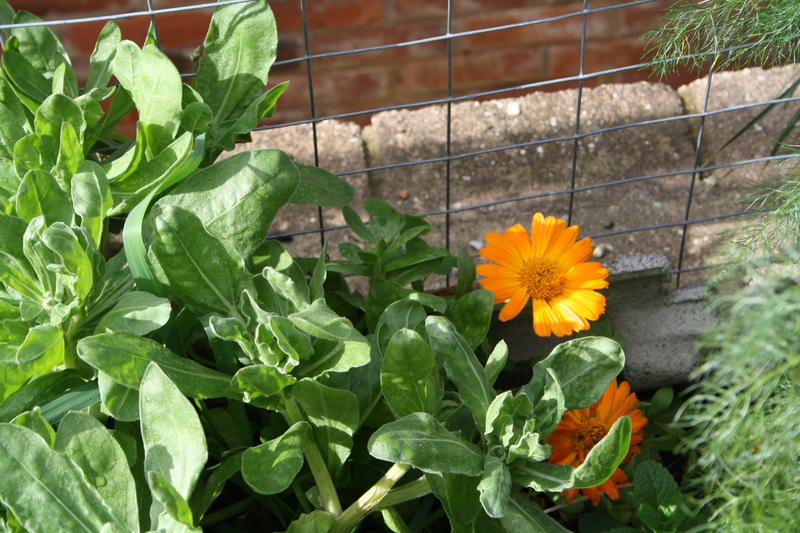 The calendula is the only thing I have had flowering throughout winter. Some rocket is about to go to seed too. I think I’ll let it do that. The bugs always seem to love flowering vegies. Jackie French in her book The Wilderness Garden suggests always letting a few vegies go to seed in your garden to help attract predator bugs. 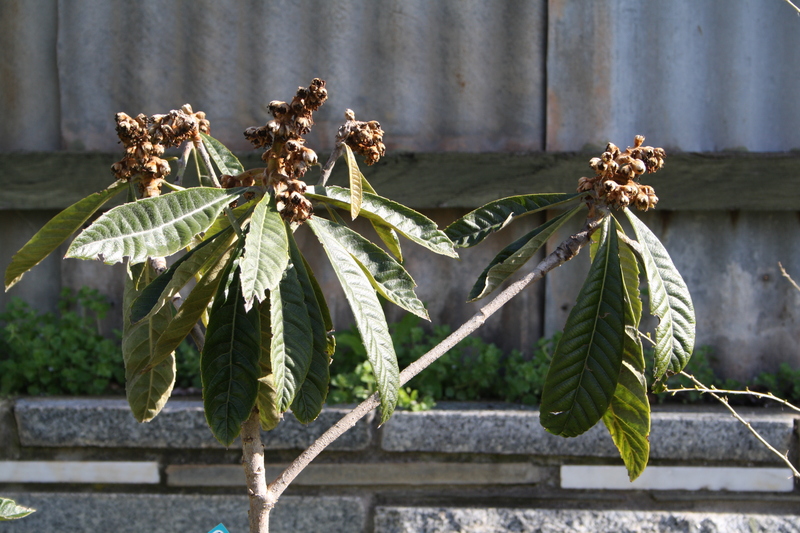 Well actually I did also have a flowering loquat. But the flowers aren’t exactly anything to look at. Of course, they could be the harbinger of fruit. This tree has only been in the ground a year so I have no idea whether these shriveled-up, dead-looking blooms will bear fruit. I know they can be damaged by frosts, so we shall see. Pruning and shaping my apple espaliers. I have three varieties that are tip bearers or partial-tip bearers (read about tip v spur bearers here. 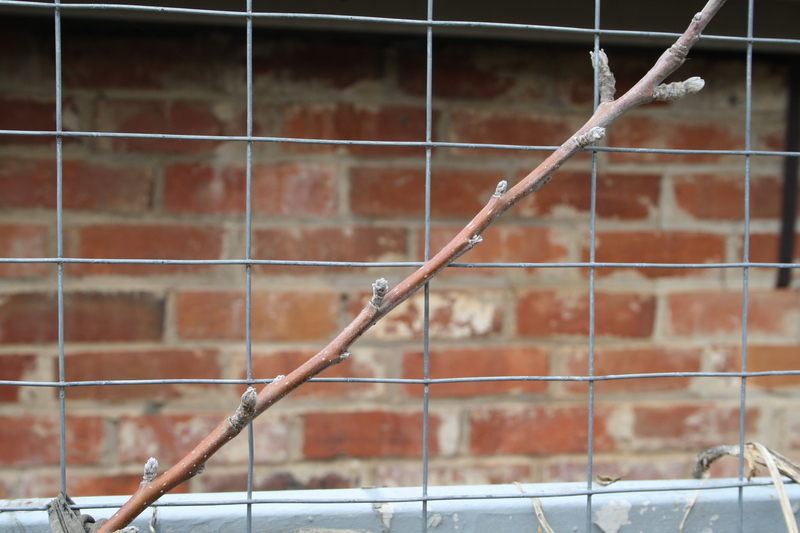 This is important if you want to espalier) and so can only be espaliered in certain forms (otherwise you’d cut off the growth where the tree flowers and fruits from). 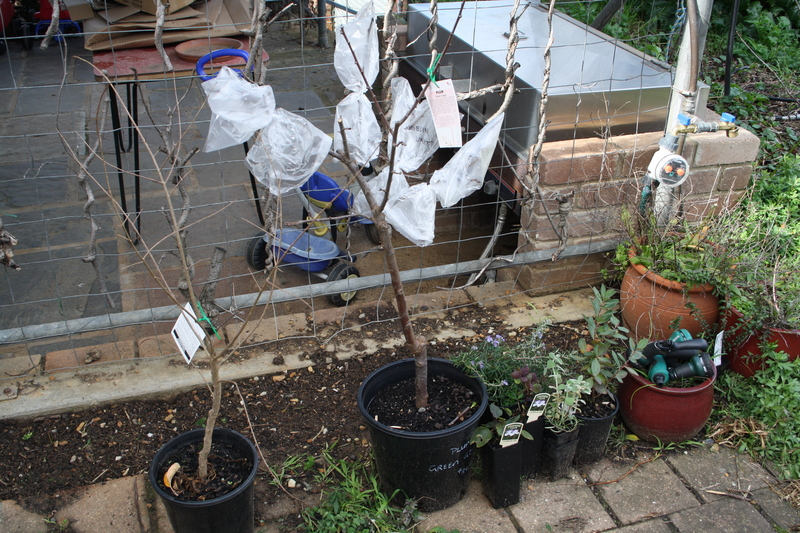 So my Bramley’s Seedling, Geeveston Fanny, and Tydeman’s Early Worcester are being trained in either a fan shape or a classic ‘espalier’ (the multiple tier ‘T’ form). 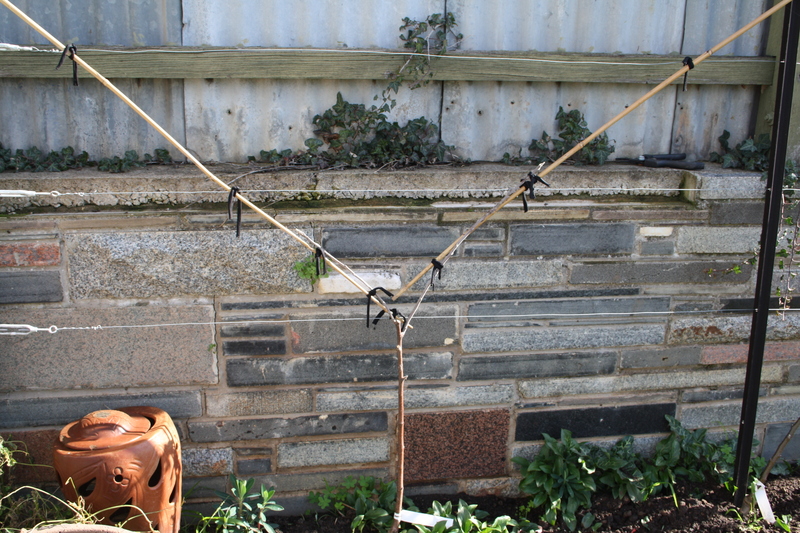 I’ve tied them (using very conspicuous and unaesthetically pleasing black tie) to canes after I pruned (following instructions because I’ve never done it before). Espaliered Geeveston Fanny on left, fan-trained Bramely’s Seedling on right. And planting of more trees continues. Replacement dwarf peach (Angel) for the one that died before shooting last year. 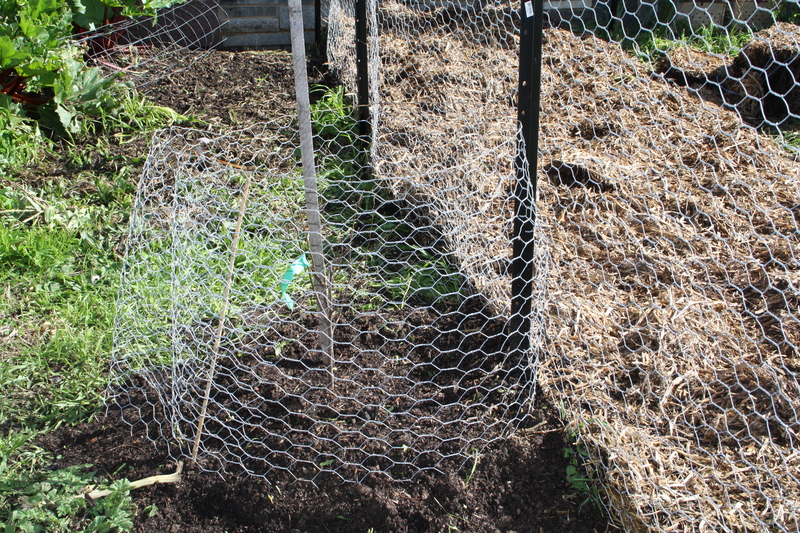 This is in the extended chicken run area so it is protected with chicken wire. My first quince – Angers variety. It’s apparently the rootstock Quince A used to graft other quince and also pear varieties. It grows to about two metres and apparently the fruit is smaller and harder than most quinces, but stores longer than most. 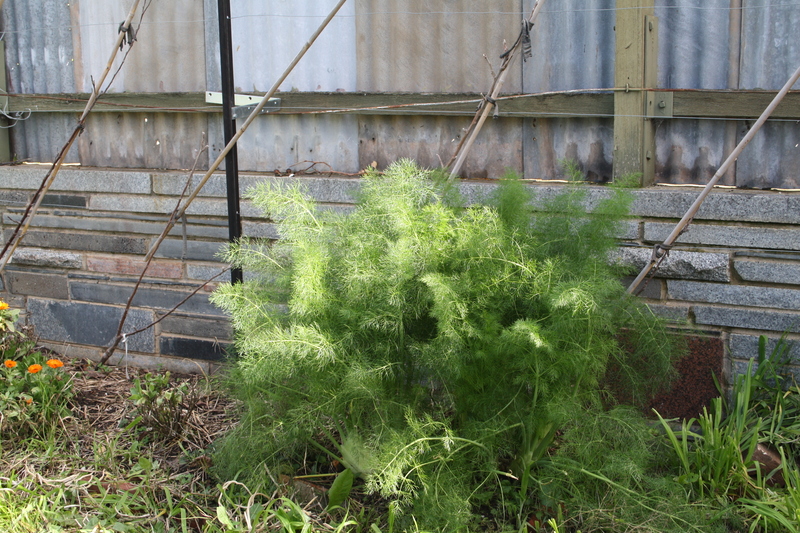 It’s supposed to bear more heavily with another variety so I’ll be planting another about two metres away (Powell’s Prize – an early variety). It had signs of bud burst when I planted it. Here‘s some interesting reading on growing quinces in Australia. Here is my personal nursery of plants waiting to be planted out. 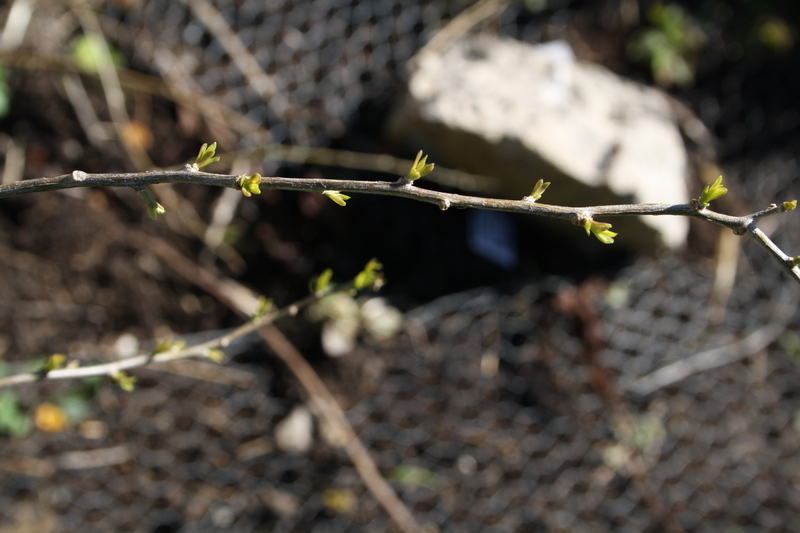 Including my piece de resistance – Greengage Plum with three other varieties grafted onto it by a really generous fellow I met through the Heritage and Rare Fruits Network Facebook group. There is also a Giant pomegranate and two caper bushes, a trailing rosemary, something called a Bupleurum I got from Frogmore Gardens, and a dwarf Ballota. And some dormant horseradish. Also underway is phase something-arather of my garden design implementation: a new garden bed (no-dig of course). I want to plant a low, evergreen informal hedge along this fence-line, either in front or behind the fence. I’m torn whether to grow maybe flowering exotics, natives (to create habitat for small birds) or fruiting shrubs, or to make it a part-perennial/flower, part-vegetable bed. 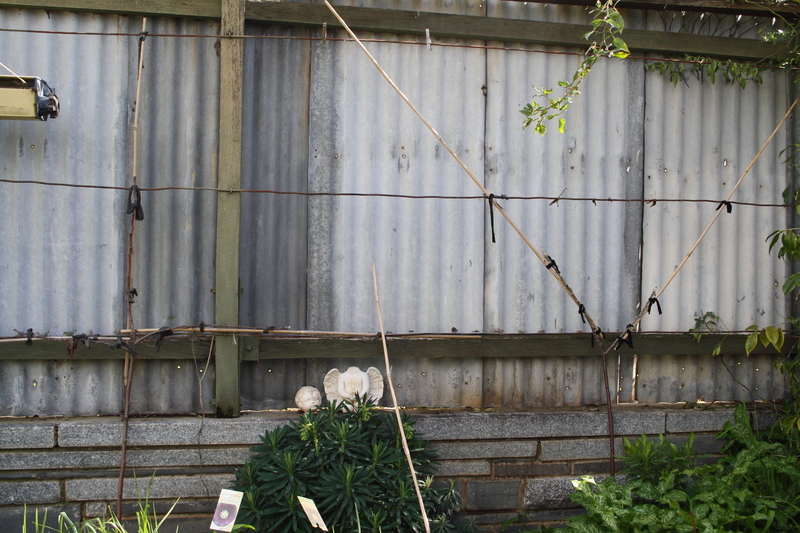 In the meantime I’m going to take advantage of the vertical space and structure and grow beans and peas up the fence this spring and summer. Which leads me to…. 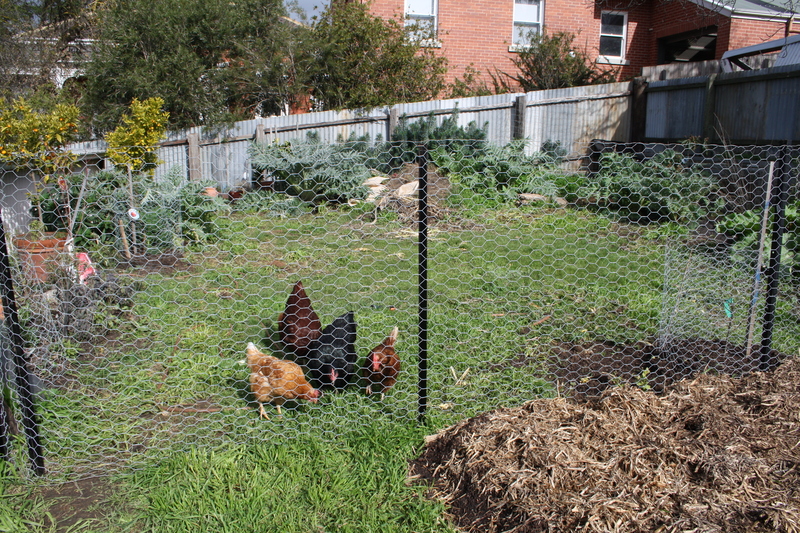 the new chicken fence! The chooks were looking pretty miserable in their dank run around their straw yard. It’s about 8-10, square only. 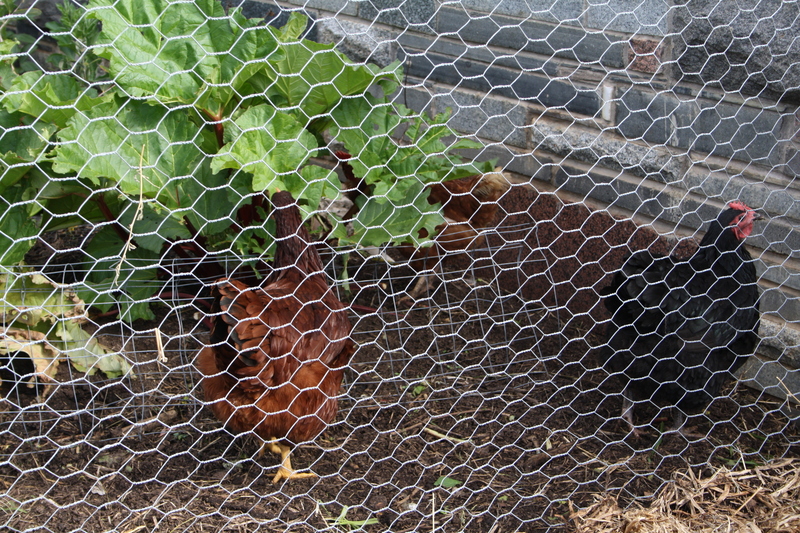 So we got into gear to do what we’d always planned – give them free range in the back half of the garden. They seem much happier. However, it has required some serious plant protection measures – they dig right into the roots of things and they trample anything delicate. 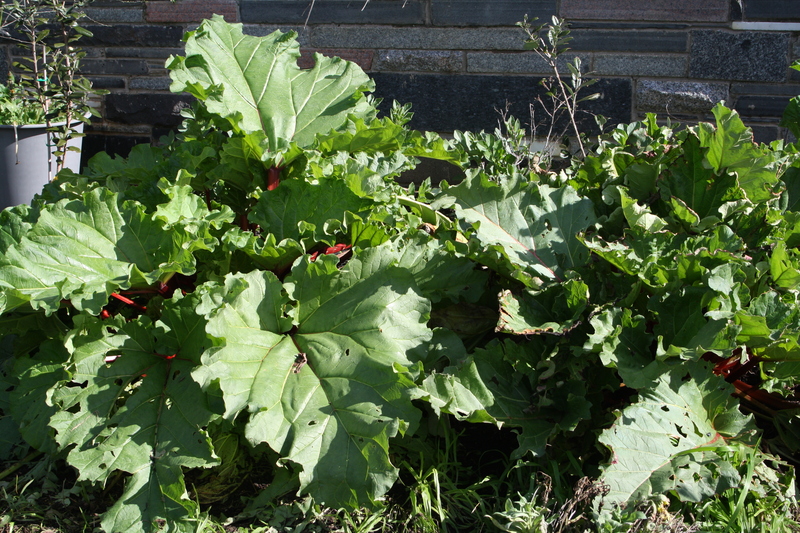 They even eat rhubarb as I discovered. And I’m a bit sad that they are digging all the worms up. But I’ll be very very happy if they’re eating things like earwigs and slaters and other nasties. 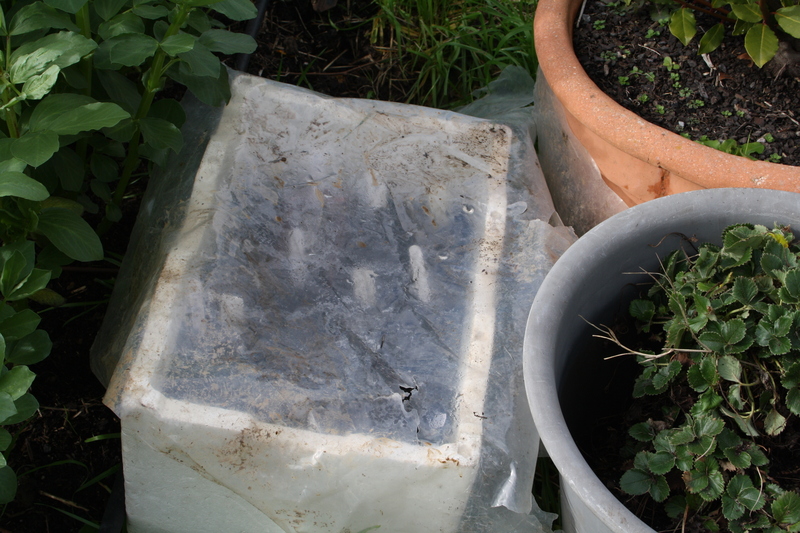 This is how I’m sowing seeds in punnets at the moment, using a polystyrene box and a piece of plastic. I think I need to bring it inside though. 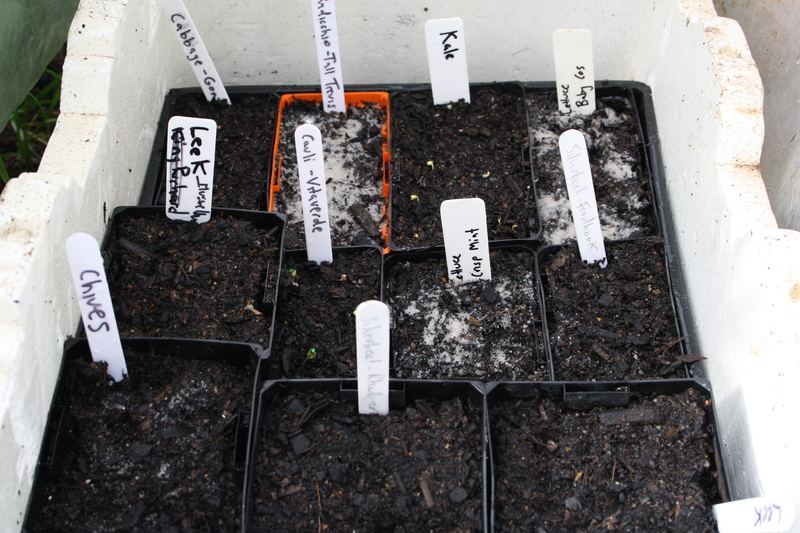 And directly I am sowing radishes, spring onions, peass, and more rocket, mizuna and spinach. 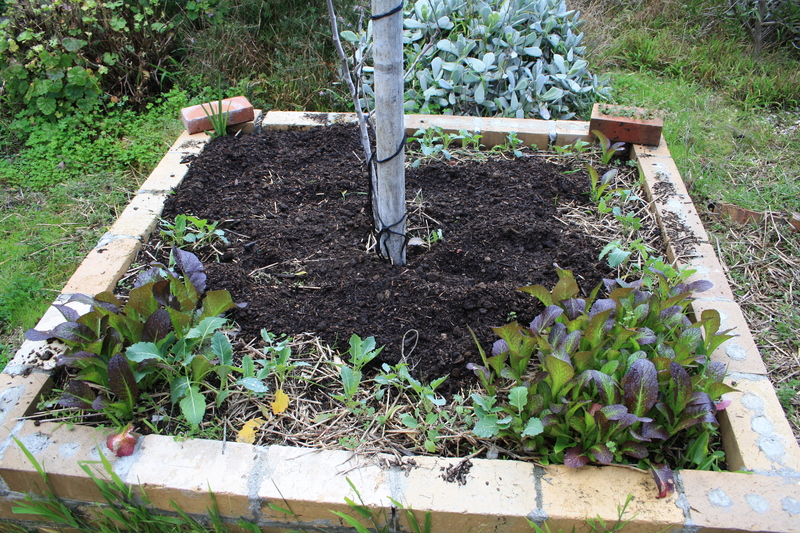 Next jobs are applying manure, compost, and seasol/charlie carp to my fruit trees and vegie beds.